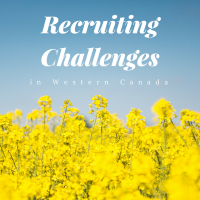 There have been a lot of changes in Western Canada over the last 3 years which have impacted recruitment and retention in the agriculture industry! It was not that long ago that there was a labour shortage in the western provinces, due in part to a thriving economy. There were more high-paying jobs than people and people were flocking to Alberta in droves from other provinces. Fast forward a few years and oh how things have changed! Lower oil prices have halted/slowed oilsands production, putting many out of work, and driving unemployment. Many agriculture employers were initially optimistic that they would have more candidates, which initially did appear to be the case. However, many employers have been hesitant to hire those from other industries, worried that as soon as the price of oil and gas rises, they will lose those employees and be back to square one. The reality is that there are now more jobseekers in western provinces, but are they the potential employees that agribusinesses want to hire?